Hidden Atlanta Home Staging Gem! VoyageATL Features Hidden Atlanta Home Staging Gem! 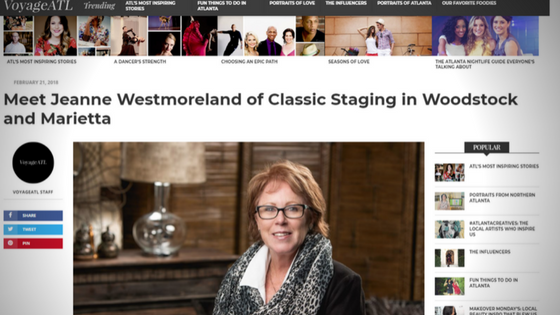 What an absolute honor that CLASSIC STAGING, LLC. was recommended by Your Right Hand, LLC. to the VoyageATL Magazine for their “hidden gem” interview! Check out the full article here! They sent me the questions, let my fingers do the talking, and even invited me to submit my pictures to be included in the article. Thank you, Hilary Wilkie, of Your Right Hand, LLC. for the referral, and thanks to Jerry King of J.King Images for the awesome headshots. A Home Stager succeeds when the Realtor, Seller, and Classic are a team! I have to thank my clients John Bailey, J.D.Kellum, Ro Preisinger, Nestor Rivera, and Lauren Stormont for your confidence in Classic Staging, LLC. ! Click on the link below to read the full article.